Are you looking for the best 100% Remy Natural Human Bangkok Hair extensions? 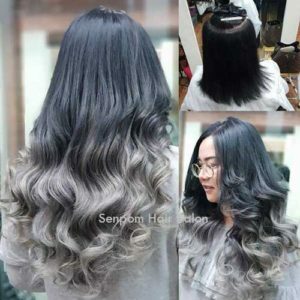 First of all,to our customers,Senpom Hair Salon Bangkok choose healthy and chemically untreated hair and therefore the highest Bangkok Hair Extensions quality. We use 100% Remy Hair,that means the hair cuticles all go in one single direction. The hair we order are hand-selected and rigorously checked for a perfect natural result. And because our close ties to the local supplier we are confident the hair comes exactly from where it says. As a result,what you see is what you get! This ensures the highest quality for our Bangkok hair extensions and enables the hair extensions not to tangle. Seems like you want to achieve a glamorous outstanding celebrity look , just feel a different woman or maybe are you bored with your thin hair? 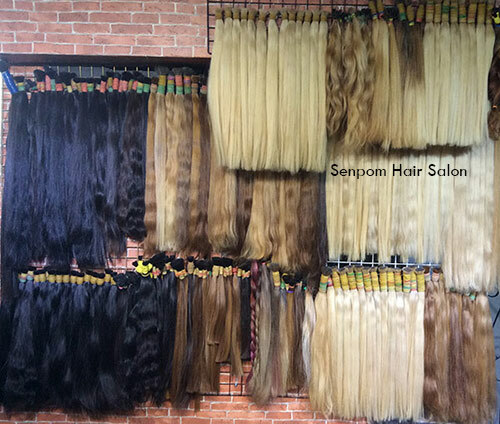 At Senpom Salon , we want our customers only enjoy their Bangkok Hair Extensions. That is why we only propose Premium Grade extensions. We offer a large selection of hair, only 100% Remy Natural Human Hair & tangle free! You can also add highlights or trendy fashion colors, with shades ranging from mild to wild , to your hair with the use of extensions. 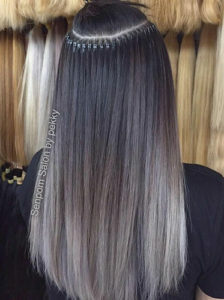 If you do simply proper care and regular aftercare at Senpom Salon you will keep your Bangkok Hair Extensions more than 1 year. For maintaining your Bangkok Hair Extensions ,you must treat your extensions exactly like your own hair if you want to keep that glossy look. Sun,wind, rain and pollution can affect our hair and it may need a little tidy up from time to time during the day. You must take a few minutes to brush through your hair in the mornings and at nights before bed. And that you will have to do everyday. No rest for your Hair Extensions! And if you like to swim,the salt or chlorine may affect your hair extensions making hair dry and unshiny. That’s why we really recommend to apply argan nourishing and softening oil. At Senpom Hair Salon we choose to use one of the internationaly known ” Moroccanoil “. Then what is the best shampoo for your Remy Bangkok Hair Extensions ? A lots of shampoos have sulfate as ingredients. Sulfates strip hair of essential oils and dries out hair. This damages hair follicles which results in hair loss, breakage and causes the hair to lack lustre and life. The best shampoo’s to use are sulfate free. And especially for Blond Hair Extensions we use a silver/purple shampoo to avoid yellow,orange and brassy color. At Senpom Hair Salon bangkok we use the best international brands of sulfates free shampoos and if you need it we can sell them. Just ask for it! We use a very high quality of hair extensions and if you take a good care, as we recommended above, they can last more than 1 year !! Hair updo,ponytail, we can ensure you that no one will know you wear extensions! We use 2 differents systems to apply hair extensions , Micro ring and Keratin Fusion Bond. At Senpom Hair Salon Bangkok we have a high level of skills for protect your real hair from hair fall. 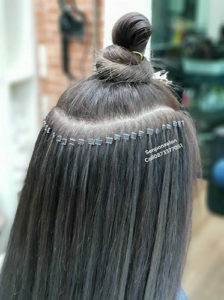 Asian hair is usually thick and strong so we can use both techniques,micro ring or keratin fusion bonds. And because western hair is usually thin and fragile,we will consequently use Keratin fusion bonds that reduce damages to real hair and make easier to remove , readjust and reapply extensions. After that , if needed,we will do a color on hair extensions to get a perfect matching with your hair color with Tec Italy or Pravana , the Famous color brands products , and do a layered hair cut to get a more natural look, and this FOR FREE !!! Not enough ??? Senpom Salon will provide you Free shampoo , Argan oil nourishing & softening treatment and curly hair styling. The essential thing we need from you is …..time. For a full head Bangkok Hair Extensions we will usually need four hours for the setup. 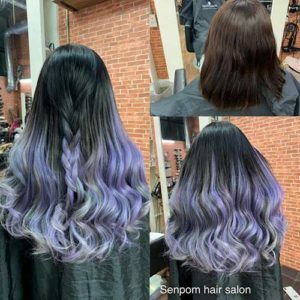 You will get a fantastic new look thanks to Senpom Hair Salon Bangkok !! Usually every six to twelve weeks (this will really depends on your lifestyle and the way you’ll take care your extensions) you will have to come back for a maintenance. We will remove the extensions,provide shampoo and nourishing cream treatment (on both your hair and extensions), retipping pre bonded extensions and reapply. For the last steps we will apply argan oil nourishing & softening treatment,make a layered haircut and curly hair styling. 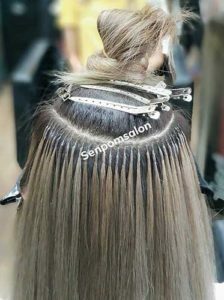 Save Up to 70% Off having your Bangkok Hair Extension at Senpom Salon. Hair extensions aren’t cheap. Depending on how much you get and how you get them attached. In America , Australia , United Arab Emirates as in Europe, the cost can range from the hundreds to the thousands of dollars,and that’s not including maintenance every six to eight weeks. At Senpom Salon we charge up to 70% less than international fares as you can see on our price list below.